Bad, or at least uninspiring, teachers: the ones the writer had hoped to study with are no longer in the city, only “junk” is left behind. Too many fees! Despite paying more and more fees, he has had to resort to self-study and learning by attending public declamations. Neglect of personal appearance: “it is my despondency about those things that forces me to disregard my physical appearance, as it is not necessary for those who are not engaged in work to care about these things”. Living in cramped quarters. The writer is currently living with another boy, Didymus (probably his brother), and is awaiting the arrival of another boy (probably their youngest brother), but is looking for a new, bigger place to live. Food parcels from home – the letter ends with the writer acknowledging receipt of various goods, including lentils, vinegar, and meat. Student life doesn’t seem to have changed that much over the past two millennia! One point is notably different, though. Despite all his problems and moaning, the writer is from a wealthy family who can afford to send a slave with him to the city: Heracles. Heracles had been sent to do unskilled labour to provide extra funds for our unhappy student, but is presented as a miscreant who has escaped and run back to tell-tales to Theon. One can’t help but wonder if this letter is a pre-emptive strike, to protect the writer from his slaves’ tales of abuse at his hand. 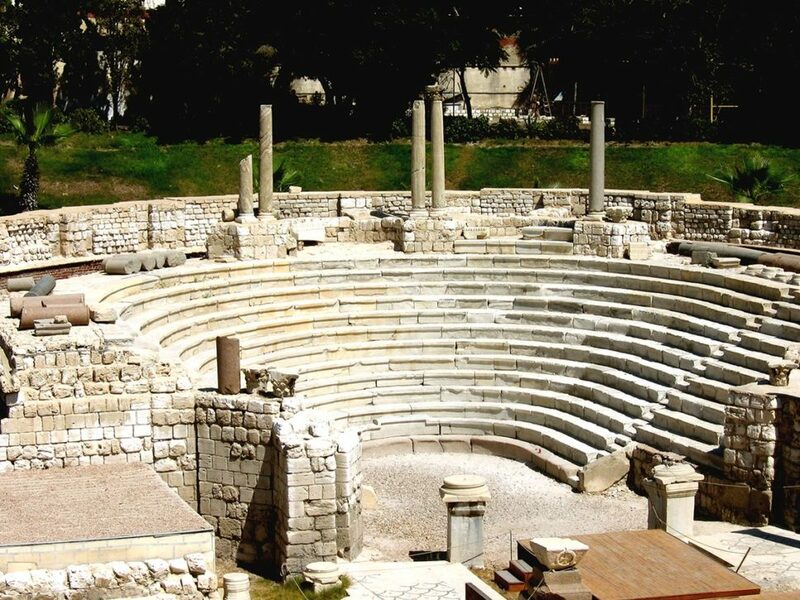 While the student only mentions individual teachers and public declamations, it is possible that he studied at the site in Alexandria known today as Kom el-Dikka, which could be described as an ancient university complex, with auditoria and the only Roman theatre to survive from Egypt, surrounded by domestic quarters and imperial baths. “To Theon, my lord and father, greetings. You have rescued us from the greatest despondency … I hoped by hurrying in sailing down that I would find fine opportunities – but what have I achieved for my enthusiasm? Even now, I am looking for a teacher and I have discovered that Chairon the teacher and Didymus son of Aristocles, with whom I have hoped that I might make progress, are no longer in the city, but only junk through whom most have taken the direct road to ruin. Previously, I wrote to you, just as I wrote to Philoxenus and company, to deal with the matter, and I was introduced by them to someone who looked suitable. But you immediately rejected him, although he had begged for Theon’s pardon, on the ground that you know him personally and he is totally lacking in ability. When I passed on your judgement to Philoxenus, he thought the same, saying that he pitied the city only for this lack of rhetors, but Didymus had sailed down [to Alexandria], apparently a friend of his who ran a school and would look after the others – and in particular he persuaded the pupils of Apollonius son of Herodas to transfer to him. They have up to now been seeking such a teacher of a higher education after the teacher they had enrolled with had died. But I, having prayed not to even look at Didymus from a distance if I found teachers worth mentioning, am depressed by this very fact: that he who used to teach in the country is settling himself up in competition with the others here. So, knowing this – that, apart from paying more fees in vain, I have gained nothing from my teacher but have achieved something by myself – please write back as soon as possible saying what you think. I have Didymus, as Philoxenos will also say, always available to me and offering whatever help he can. Furthermore, by auditing the public performances, including those of Poseidonius, if the gods are willing I will quickly make good progress. But it is my despondency about those things that forces me to disregard my physical appearance, as it is not necessary for those who are not engaged in work to care about these things, especially when they don’t have anyone to bring in some money. For once upon a time after a few days the helpful Heracles – woe of woes – would bring in some obols, but now along with his being put into restraints by Isidorus, he has run away and gone off, so it appears, to you. Be well aware that he isn’t averse to plotting against you if he has the opportunity. For he is not ashamed, especially to spread tales of events in the theatre and the city with alacrity and to babble out lies that no prosecutor would declare – and he has done this although he hasn’t suffered anything such as he deserved, but had been let roam and was acting like a free person in all matters. But, all the same, you can hire him out to a builder if you don’t send him back, as I hear that a young man can make 2 drachmas a day. Or assign him some other task, where he can earn more money, so that the wages collected by him can be sent to us from time to time. For you know that Diogas is studying literature as well. In the time it takes you to send the young fellow, we will look for a bigger place in a private house: in order to be Dionysius’ neighbours, we have been living in a very small place. We received the basket that had all that you wrote about safe in it: all the jars with the half-cadus, in which we found not 18, but 22 choes. And I sent a half cadus with a letter to all you wrote about. I got the six measures of whole lentils and a Coan jar full of vinegar, and 126 pieces of salted meat, plus those in the jar, and 30 pieces of cooked meat.